between southern China and the Pratas islands, which are occupied by Taiwan. The Nanhai 4 rig was towed close to the Chinese coast. The agency did not say who owns the rigs. Earlier this week, it gave coordinates for a fourth rig, the Nanhai 9, which it said would be positioned just outside Vietnam's exclusive economic zone by Friday. The announcement comes at a time when many countries in Asia, particularly Vietnam and the Philippines, are nervous at China's increasing assertiveness in the South China Sea, where sovereignty over countless islands and reefs is in dispute. 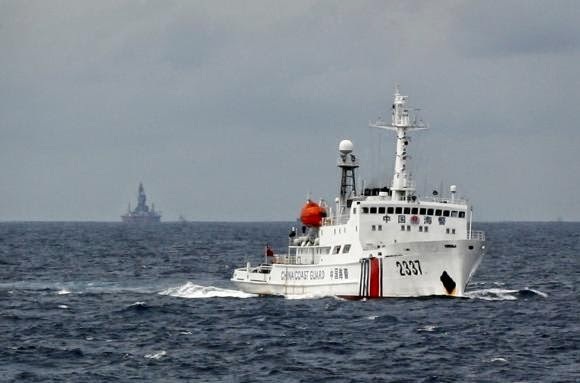 The Global Times, a popular tabloid published by the Communist Party's official People's Daily, quoted Zhuang Guotu, director of the Center for Southeast Asian Studies at Xiamen University, as calling the rig deployment a "strategic move". "The increase in oil rigs will inevitably jab a sensitive nerve for Vietnam and the Philippines," Zhuang said. China's state oil behemoth CNOOC Ltd has said it had four new projects scheduled to come on stream in the western and eastern South China Sea in the second half of 2014. CNOOC has said it would increase by up to a third its annual capital spending for 2014 to almost $20 billion. Anti-Chinese violence flared in Vietnam last month after a $1 billion deepwater rig owned by CNOOC Group, the parent of the listed unit, was parked 240 km (150 miles) off the coast of Vietnam. China claims about 90 percent of the potentially energy-rich South China Sea. The Philippines, Vietnam, Malaysia, Brunei and Taiwan also have claims to parts of the waters.